"... fine sounding, sensitively paced ... with good, fairly chaste choral singing and an especially impressive baritone in Thomas E. Bauer ..."
"... (the choir) sings beautifully throughout ... Libor and Bauer are excellent singers and the orchestra is also first-class ... Wit conducts with considerable insight and interpretative command ... recording quality is equally first-rate." "The Warsaw Philharmonic Choir, highly capable of the most subtle gradations of tone, is always here the centre of creativity, creating the music’s existential continuum and arising to sombre unexpected splendour ... there is some beautiful orchestral playing ..."
"... (orchestra and choir) outdo themselves, with some especially fabulous singing that is worth the price alone ... Wit uncovers all sorts of wonderful details in the low strings and winds ... attention to dynamics, especially in the singing, is simply tremendous. This is really moving ... both heartfelt and rewarding." 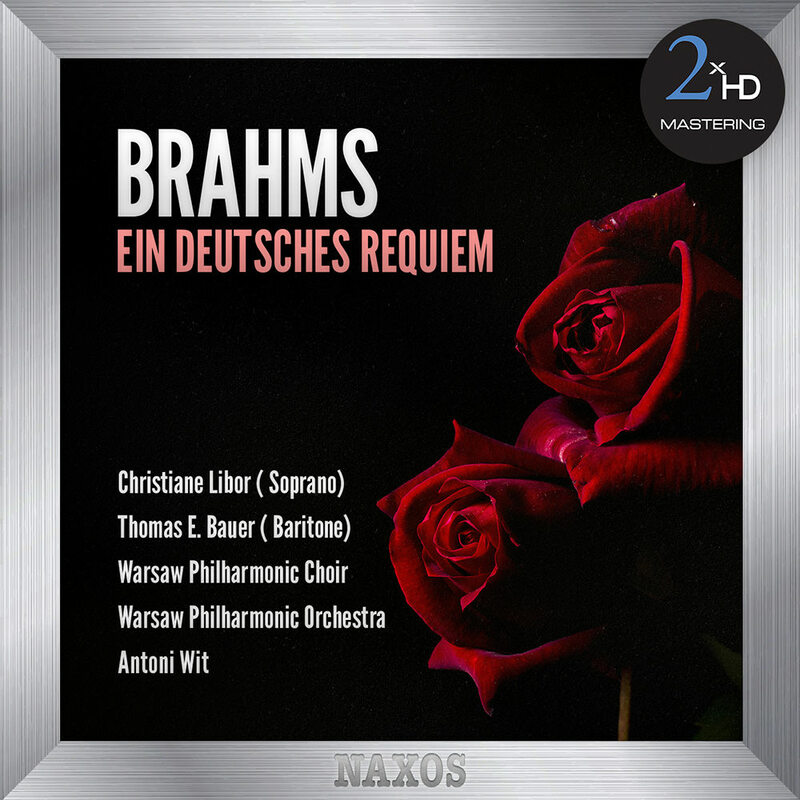 Antoni Wit and the Warsaw Philharmonic Orchestra and Choir follow their successful recording of Brahms choral music with this highly praised presentation of the longest work in Brahms’s entire oeuvre, A German Requiem. Baritone Thomas E. Bauer and soprano Christiane Libor are the featured soloists on this emotional composition, triggered most likely by the death of Brahms's mother and inspired by the death years earlier of his friend Robert Schumann. Taking inspiration from Bach’s contrapuntal genius but avoiding overt religious tradition, Brahms chose the texts himself, placing an emphasis on an affirmation of life. This album was mastered using our 2xHD proprietary system. In order to achieve the most accurate reproduction of the original recording we tailor our process specifically for each project, using a selection from our pool of state-of-the-art audiophile components and connectors.The process begins with a transfer to analogue from the original 24bits/96kHz resolution master, using cutting edge D/A converters. The analogue signal is then sent through a high end tube preamplifier before being recorded directly in DXD using the dCS905 A/D and the dCS Vivaldi Clock. All connections used in the process are made of OCC silver cable. DSD and 192kHz/24-bit versions are separately generated, directly from the analogue signal.